Rise of Moloch offers players a chance to return to the alternate history of London in the World of SMOG. The second entry in the series is an exciting stand-alone adventure for three to five heroes. One player takes on the role of the Nemesis, working to summon the ancient demon Moloch. The rest of the players become the Gentlemen of the Unicorn Club, working together to defeat the Nemesis and derail their evil plots. Rise of Moloch is an exciting adventure, played out over a series of Chapters. There are a ton of different directions the story can take, ensuring that no two campaigns are ever the same. Between each Chapter, players will get a chance to upgrade the skills and abilities of their Gentlemen. They will need all the extra help they can get to take on the minions of the Nemesis, from the members of The Cult to the twisted family of the Grotesque Company Circus. 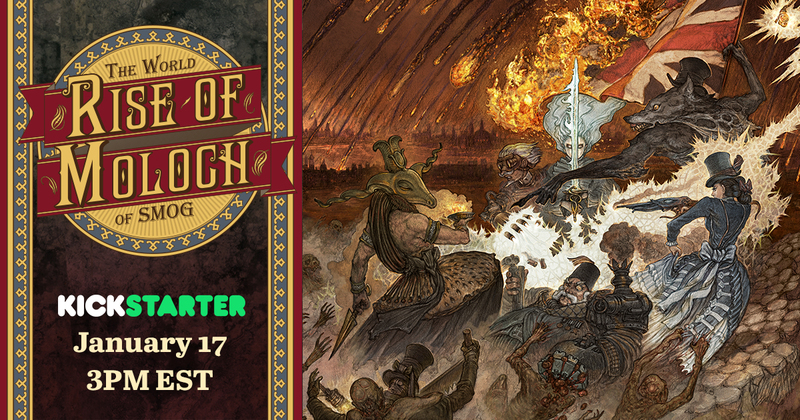 The Rise of Moloch Kickstarter is live now. Grab your equipment, assemble your team, and get ready to plunge into the excitement of battle. The fate of London, the Queen, and the entire World of SMOG is in your hands!